Mitsubishi and Hindustan Motors alliance in India ha launched the Mitsubishi Pajero Sport and Mitsubishi Outlander 7 seater option in India recently. On the sidelines of these launches, Masahiko Ueki, Executive Officer and Corporate GM, Mitsubishi Motors, Japan revealed the intentions of bringing the global small car from Mitsubishi, the Mitsubishi Mirage in India after it is launched in Thailand in March 2012. Mitsubishi has launched the Mirage officially in Thailand this week and we expect that the next stop for Mirage should be in India. 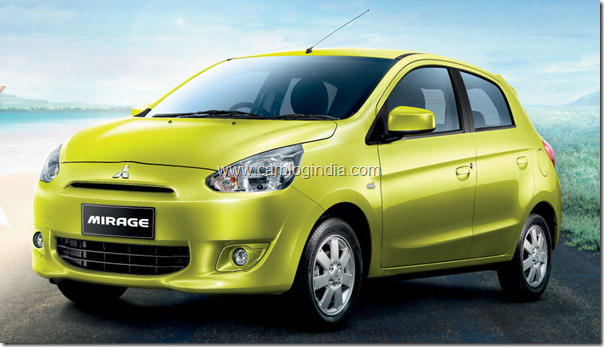 Mitsubishi is quite optimistic about the Mirage global small car and plans to sell it in many counties including Asian markets like India, Thailand, Japan etc. and will also sell in Europe in the coming months. Mirage is powered by a 1.2 Litre 3 Cylinder MPFI Petrol Engine with 77 BHP of peak power @ 6000 RPM and 100 Nm torque @ 4000 RPM. In terms of dimensions, the Mirage measures 3710 mm in length, 1665 mm in width, 1490 mm in height and a wheelbase of 2450 mm. It has a small turning radius of just 4.4 m.This is somewhat close to Nissan Micra in terms of dimensions and styling with well rounded design and attractive looks. The weight of Mitsubishi Mirage is between 830 Kg to 870 Kg and its aerodynamic structure makes it a fuel efficient car in its size and price segment. The engine is mated to a 5 speed manual transmission system and also offers CVT automatic transmission option in Thailand. The steering system consists of an electrical power steering system for comfort and higher fuel economy. The Mirage uses disk brakes at front and drum brakes on the rear wheels. The car rides on 14 inch steel and alloy wheel options and the tyre size is 165/65 R14. Mirage is made using high technology impact resistant structure which makes it safer in case of a collision or crash. In terms of features, it offers Fog lamps, electrically foldable and controllable outside rear view mirrors, rear defogger, rear high mounted LED stop lamp, body coloured outside door handles and bumpers, 3 spoke steering wheels design, tilt adjust steering wheel, Tachometer, MID, Driver side seat height adjustment, Split seats at rear, power windows, power steering, central locking, keyless entry, air-conditioning, Built-in Audio system with USB, AUX input and Bluetooth connectivity with phones. On safety side it offers ABS and EBD, Dual SRS airbags, Engine immobilizer etc. 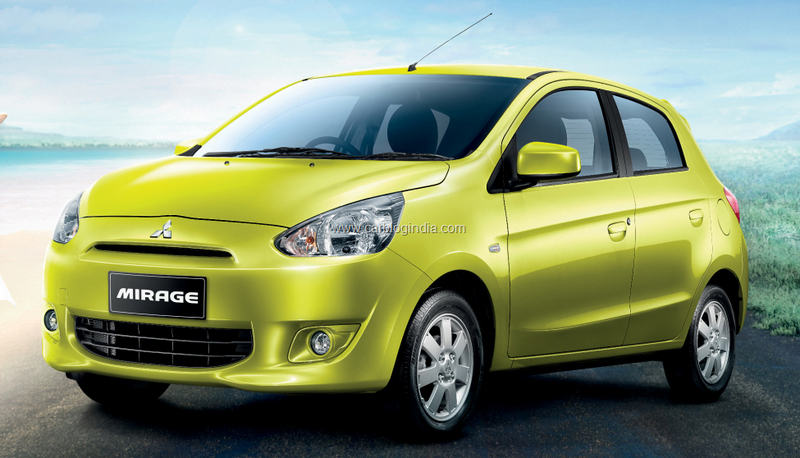 Mitsubishi Mirage has been launched in Thailand at 3,80,000 Bhat which is approximately Rs. 6.3 Lakhs in Indian currency. The Mirage will surely drop some of the features and gadgetry when launched in India and the price will be kept in a price range or Rs. 4.5 Lakhs to Rs. 6 Lakhs to make Mirage compete in the premium hatchback segment against cars like Maruti Swift, Hyundai i20, Nissan Micra etc. We will keep a check on the updates of Nissan Mirage launch in India which we expected should happen towards the end of the year. For latest updates, do stay tuned by signing up for our free email newsletter and like our official Facebook Page here.